This November, Lagos will be taken on ‘A Journey of Wonders’ at SPANFEST!! 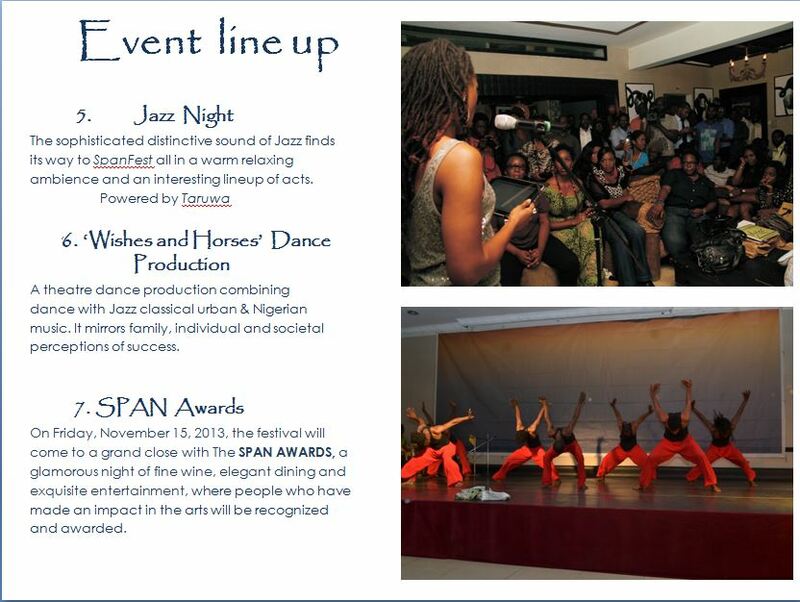 ‘Society for the performing Arts in Nigeria’ SPAN presents SPANFest, an 8day performing arts festival which will hold from November 8 – 15, 2013 at Oceanview, Eko Hotel & Suites, Victoria Island, Lagos. ‘SPANFest is designed to be an 8day festival presenting workshops, and events which will showcase performances and presentations in various forms of performing arts including Dance, Music, Spoken word, fashion Theatre and Comedy. This debut of what plans to be a bi-annual event is tagged ‘A Journey of Wonders’, as the organising team plans to give attendees a memorable experience by bringing together International and local artistes to make ground-breaking presentations at well-crafted events. SPAN festival makes a grand opening on Friday, November 8, with ‘Battery Dance Company’, a prestigious international dance group coming in from New York; they kick-off the festival with a captivating show. 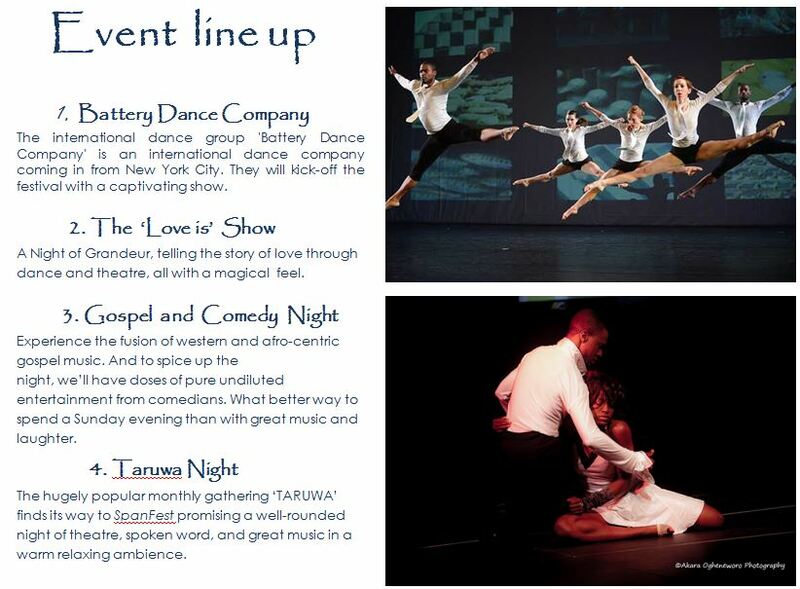 During the Festival week, there will be music and dance workshops during the day, headed by facilitators coming in from New York, while each evening will deliver world class entertainment through Theater productions, Dance presentations, Music events, and comedy including a Jazz Night, Taruwa evening, and Wishes & Horses, a theater production. On Friday, November 15, 2013, the festival will come to a grand close with The SPAN AWARDS, a glamorous night of fine wine, elegant dining and exquisite entertainment, honoring individuals and Organisations that have made an impact in the arts. 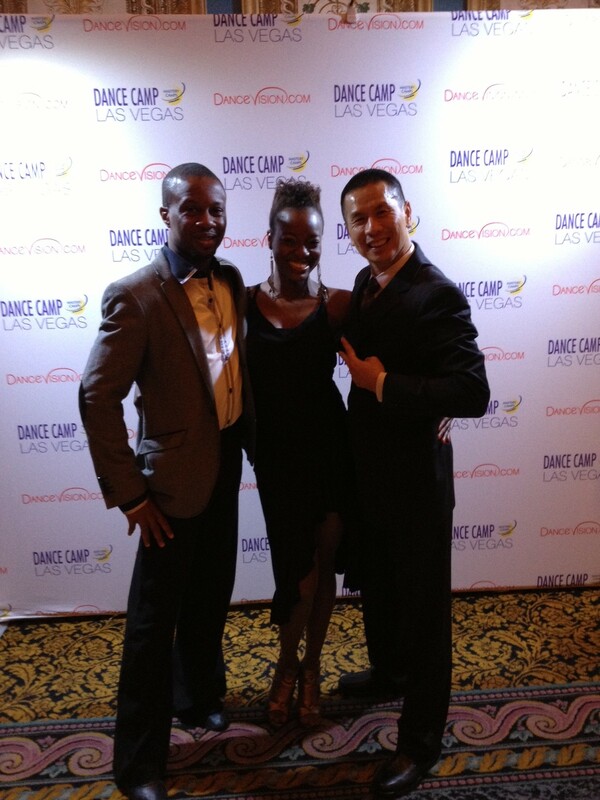 On June 16, two of SPAN’s finest, Ice [Creative Director] & Ukalina [Head of Dance] were sent to Las Vegas, for training as teachers in Latin and Ballroom. They were taught by professionals, Katarzyna Kozak and Marcin Tomaszewski, amongst others. The training went beautifully, so let’s just say that what happened in Vegas didn’t quite stay in Vegas as they have since returned to Lagos, but the excitement from the experience still lingers! Next stop before their return was California, where they went for their Bronze and Silver certification in International Style. Ice & Ukalina had the best as they were trained by Latin and Ballroom ‘heavyweight’ Coaches; Kasia Kozak, Diane Jarmolow, Thomas and Isabella Lewandowski under Dance Vision. 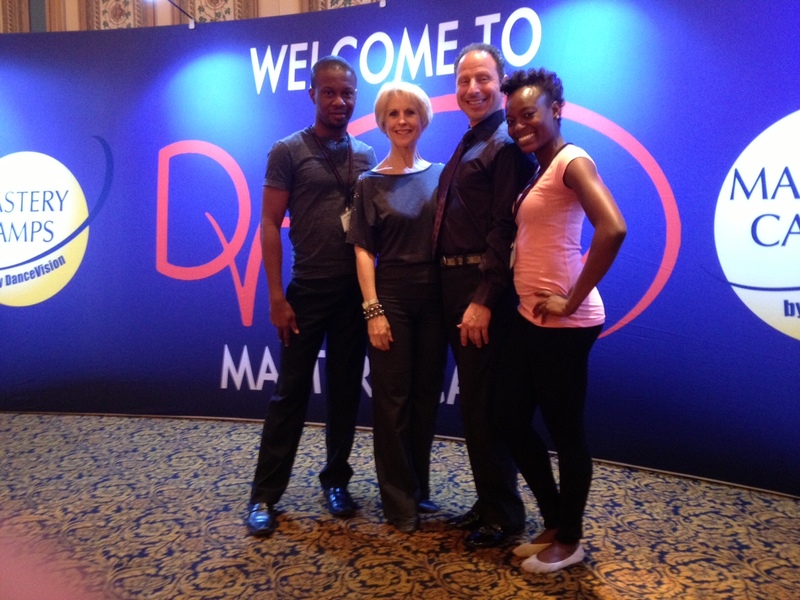 They had a meeting with Founder, Mr Wayne, and Dance vision Examiner, Mrs Diane, who after viewing their overall skills proposed to make them Dance Vision Examiners in America and Africa! Awesome right?! So, Ice & Ukalina are done with the first stage of the certification which is the Associate level and they intend to finish as Dance Vision fellows within the next 6months. Dance Vision was obviously impressed with SPAN as they have great plans to work with us in the growth of Latin and ballroom in Nigeria. We definitely are looking forward to that! Sunday, September 29, 2013, was a beautiful day! We celebrated young Nigerians at The Grand Ball Room of the Eko Hotel & Suites, V.I, Lagos. Parents arrived with their wards. Some guests came as couples. A few came in school uniforms. Cameras were clicking away and details were being written at the front desk. The Grand Ball Room ofthe Eko Hotels and Suites was filling up gradually as smooth music played to the delight of those already seated. This was not a valedictory service nor was it an end of year event ofan academic institution. Ink Marks was presenting a testimony in social entrepreneurship; a presentation of creativity from a team of talented young boys and girls. The name of the event was INK MARKS and SPAN: A Season for Award and Reward 2013, featuring children from a broad spectrum of secondary schools; private and public between the ages of 12 and 18. It chronicled a period of mentoring, coaching and skills impartation; a journey of dedication, endurance and long suffering towards blooming these young, bright minds articulate the creative zest typical of their age. They did not disappoint. The event started with a presentation that would define the overall theme of the event, a soulful rendition of the National Anthem by one of the kids on parade, Sena Domino . According to Ita Hozaife, veteran theatre director and producer and convener of the event ‘there are obstacles. They will not be easy but like the tree in the video, it is doable.’ The video in particular was a short campaign trailer set in India. It captured a young schoolboy take initiative in trying to move a huge tree trunk that was blocking a major thoroughfare. His act of selfless service did not go unnoticed. A chain reaction of swelling support from bystanders and those affected by the blockade eventually led to the removal of the obstacle, the tree trunk. The event progressed with the presentation of awards for different categories, rewards for participants who stood out during the two weeks of training and mentoring. In-between the presentation of awards, there were music videos featuring other participants singing to original songs composed by them, each capturing their passion for Nigeria as a great nation. Without a shade of doubt, there is hope for the country, and a generation is in firm grip of that torch of hope. The Master of Ceremonies, veteran music producer, Mr Kehinde Dacosta-Lawrence steered the event as each music video showcased the innate skills participants demonstrated while the mentoring and coaching sessions lasted. According to the CEO of Ink Marks, Ita Hozaife, calls for intending participants to audition were made and respondents shortlisted. Preference, however, was given to public schools. Mentors in music, dance, presentation, leadership, and writing were on hand to volunteer their experience and expertise towards nurturing the young and budding minds. They coached them in a variety of skills acquisition and importation sessions which included singing, writing, presentation and leadership. At the end of the training period, the winners of the respective awards were well deserved in their achievements. The event was graced by the representative of the First Lady of Lagos State, Dame Abimbola Fashola, on whose behalf the keynote address was delivered. The high point of the event was the spellbinding speech by Munachisom Nwadike. He captivated the audience with his witty and engaging anecdotes and got a standing ovation from the audience; an undeniable testimony to his being awarded winner of the I HAVE A SPEECH Award for Reel Kids 2013. While presenting the award to Munachisom Nwadike, Mrs Benny Uche of the United States Information Service expressed her pleasure at the display of talent and creativity. Other wards presented include Most Inspiring Reel Kid, Original and Creative Reel Kid, Best Behaved Reel Kid, Best Team Player and Reel Kids All Star. Other awards include Best Original Song and Best Music Video Concept. The kids couldn’t have pulled it off without the coaching from their mentors. In a heartwarming show of appreciation, they presented individual awards to each of their mentors in recognition of how much they had imparted hope and confidence in them to achieve and excel. Among the mentor-awardees were Sarah BOULOS, Chairperson Society for the Performing Arts in Nigeria, Phillip Trimnell of Music Africa and Sola Soetan, Music producer and gospel recording artiste and award winning dancer, Kaffy. A turning point was presentation by Mr Ugochukwu Omeogu, CEO of Joseph Consulting. He supported himself on his crutches as he approached the podium and announced his organization’s support of the programme with sponsorship of the four finalists from the I HAVE A SPEECH contest. 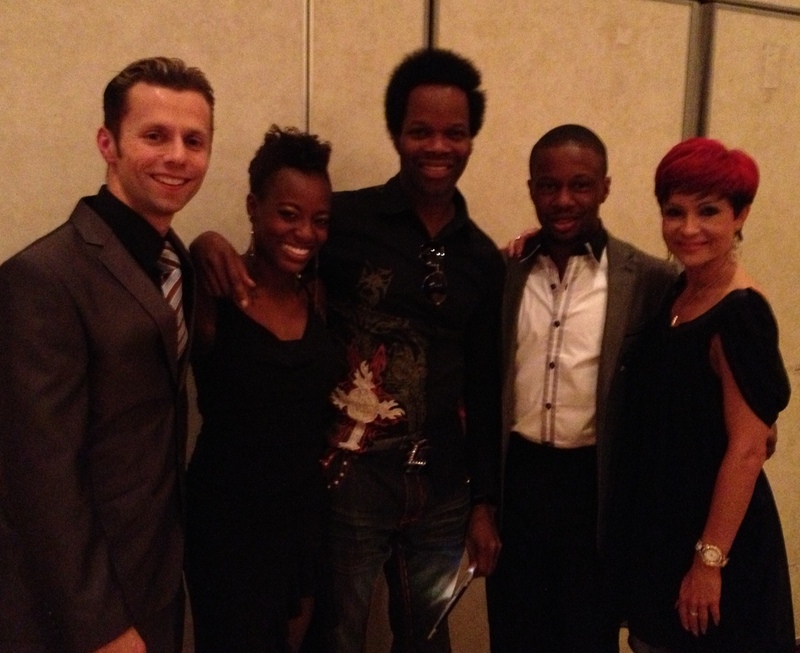 They lucky quartet were Tosin Femi Lawal, Ibeh Ikechukwu, Joanne Mary and the winner, Munachisom Nwadike. They would undergo free coaching in presentation, coaching and mentoring at his establishment. The event also featured a video presentation by the Society for the Performing Arts in Nigeria SPAN, also one the major supporters of the programme. Gifts and products from Dufil Group, makers of Indomie, were handed to the winners and participants. Other supporters were Eko Hotels and Suites, Music Africa, Diamond Bank, Benita Ventures, Cool FM, 7UP, DSFC, and Coollink. The event, no doubt, echoes an undeniable fact; the young generation of today have a huge role to play in the affairs of tomorrow and they are not afraid to prepare for it. As long as they have mentors and coaches to guide them in the process, they are willing to fly as high the altitude permits. This is what the programme achieved yet again.